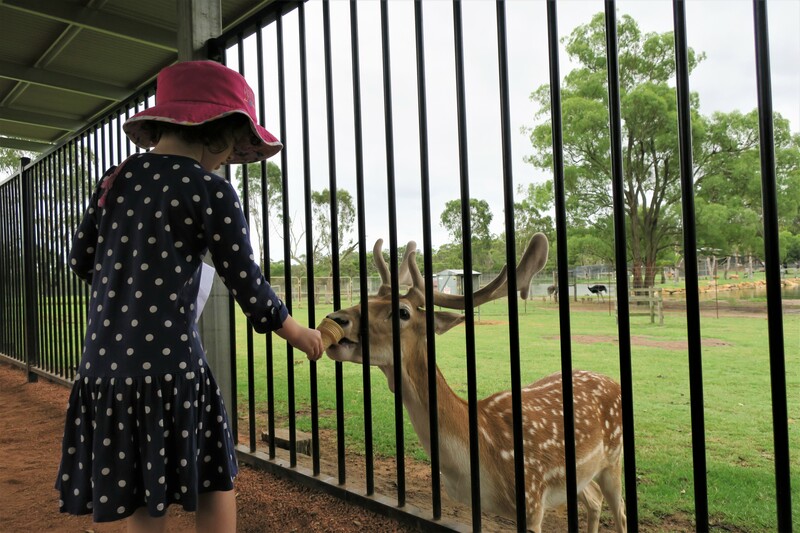 If you haven’t been to the Hunter Valley Zoo in Nulkaba, then pack a picnic and head there pronto! 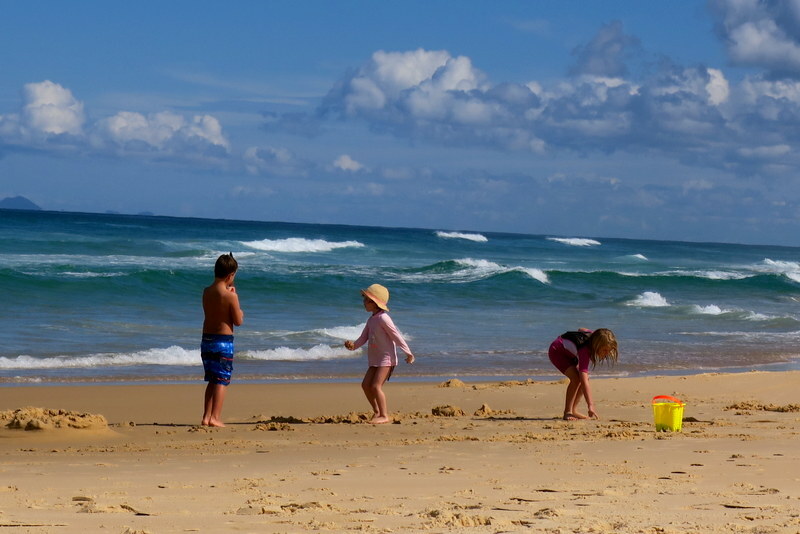 We went for the first time on Boxing Day with Nanna and the Sydney cousins, and we had an absolute ball. 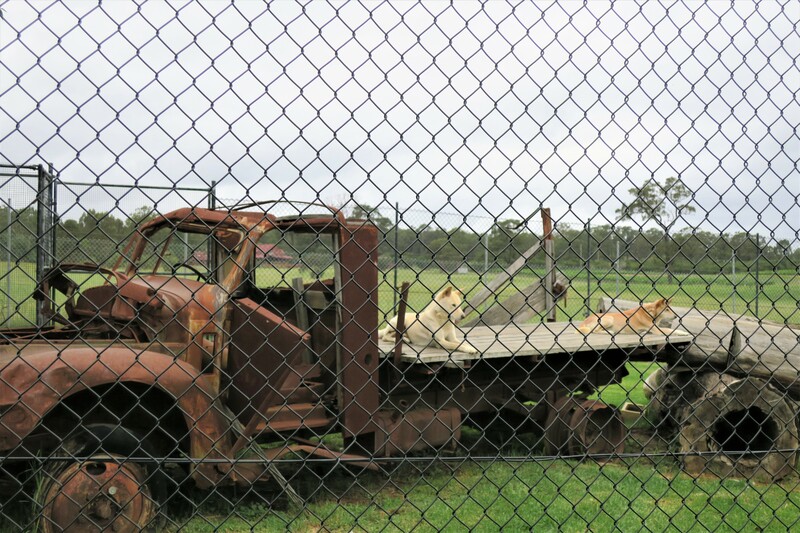 The Hunter Valley Zoo originally opened its doors in 2006 on the site of a former deer park. Although it hasn’t been around for long, the zoo has built up a lovely collection of animals (both furred and feathered) and an excellent reputation. 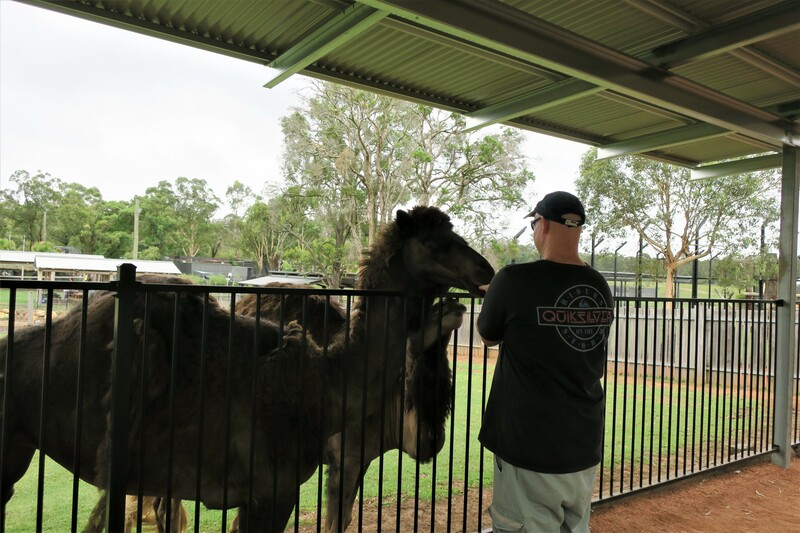 Wallabies, lions, alligators and – my personal favourite – a tapir, are just a few of the creatures on show. 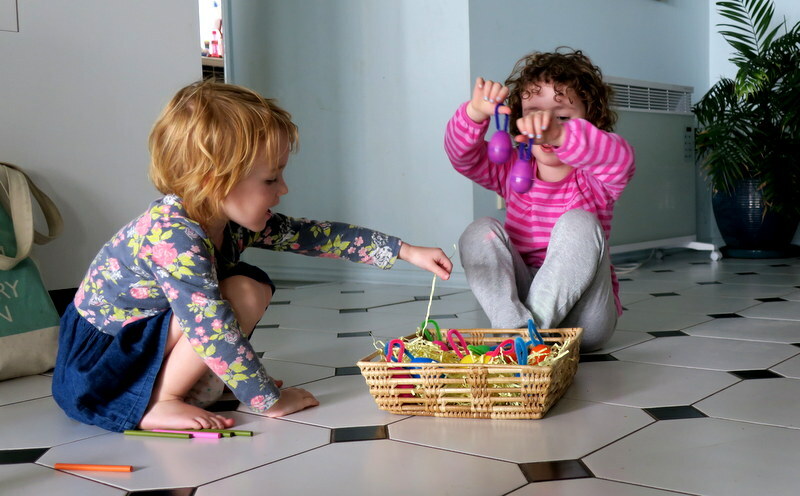 And the site is small enough to be totally manageable with little people. It is also beautifully kept, with clear signage to tell you what you’re looking at. Just in case you think that the brown camels are in fact llamas, like muggins here . 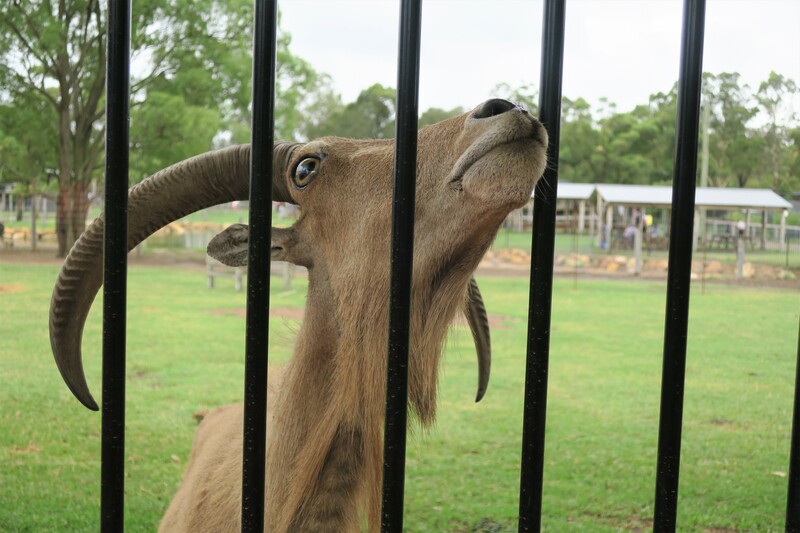 . .
We loved that you can get up really close to some of the creatures – like these goats, deer and llamas (er, correction: camels). We actually went in a pen with some goats, too, but I didn’t get a pic as they were super-excited to see us (i.e. leaping around, rearing up on their hind legs as they tried to reach the cones of food we had bought on arrival). Yes, we weren’t feeding the friendly creatures ice cream, in case you were wondering from the photo below; the cones actually contain special animal pellets. 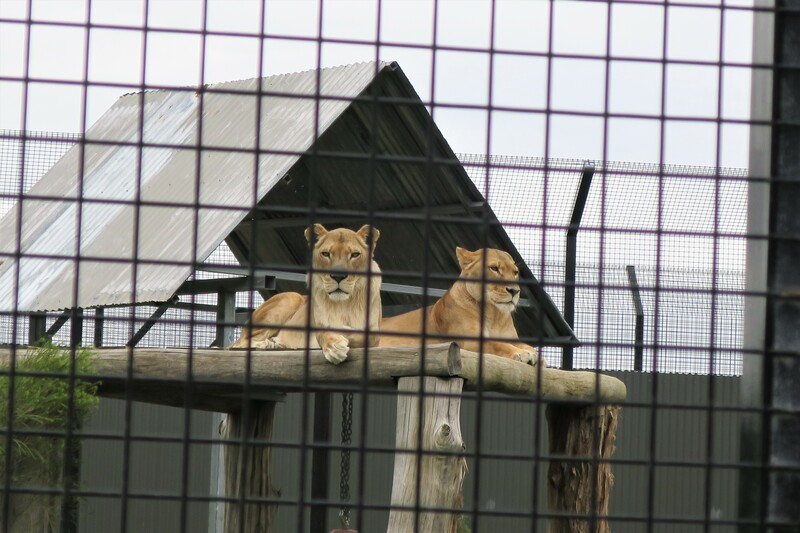 The zoo is open every day during the school holidays. Ickle and Mivvy both gave it a big thumbs up. Ickle particularly liked the dingoes and wolves and Mivvy thought the sheep were great. Looks like we’ll be going back again in 2018! 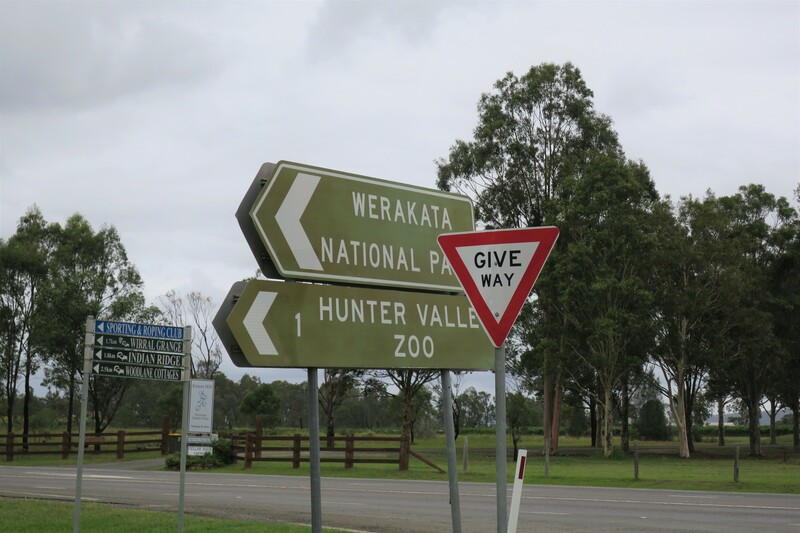 This entry was posted in Adventures, Close to home and tagged alligators, camels, deer, dingoes, goats, Hunter Valley Zoo, lions, sheep, tapir, wallabies, wolves on December 31, 2017 by Laura. 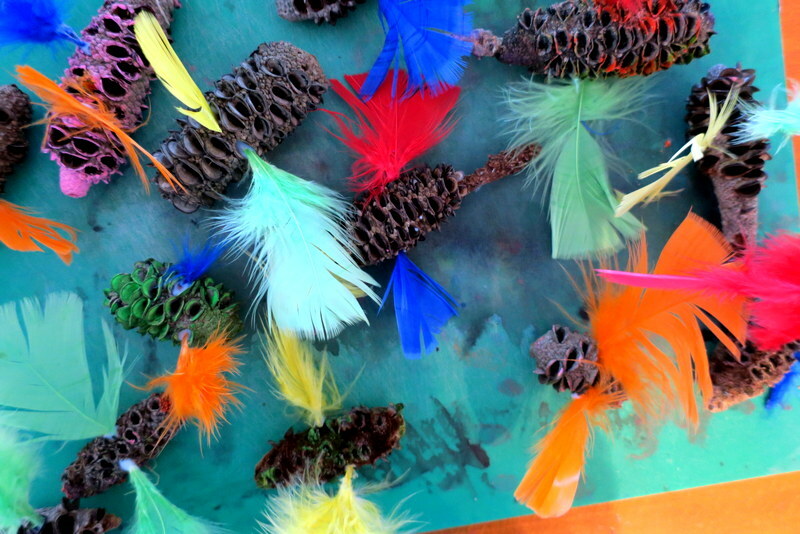 We’ve been working on these feathered friends on and off for a month. A few weeks’ ago, Ickle and Mivvy collected a whole bag of banksia seed pods on an excursion to Norah Head lighthouse, one of our favourite destinations. The pods were scattered along the roadside and each one was excitedly scooped up and popped in our bag. 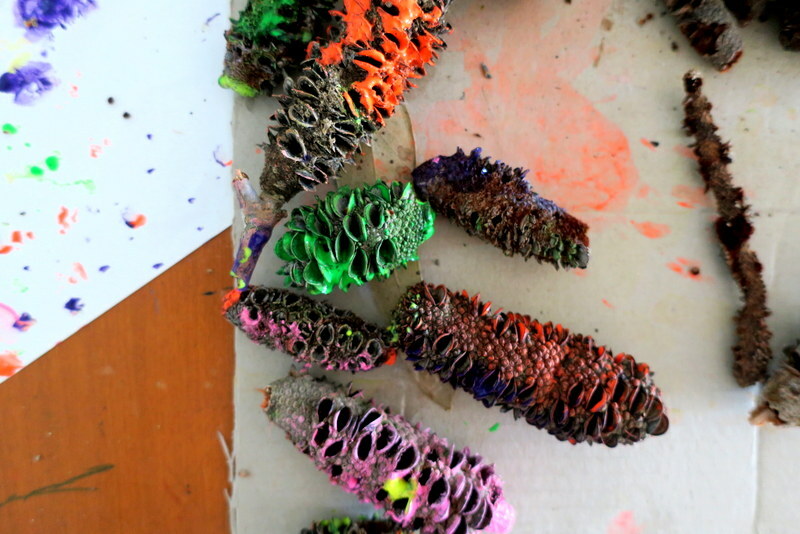 Then my creative duo painted a selection of pods and left them to dry on the verandah, for ages. OK, we forgot about them, although one lucky pod did accompany Ickle to school for “News”. 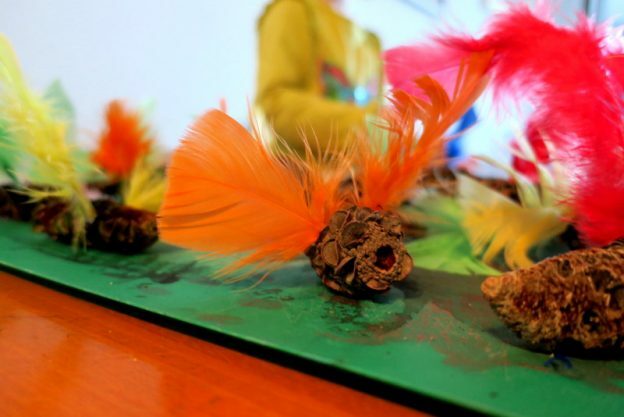 This is a weekly slot where each child in Kindy has to present an object or tell a short story to the rest of the class. 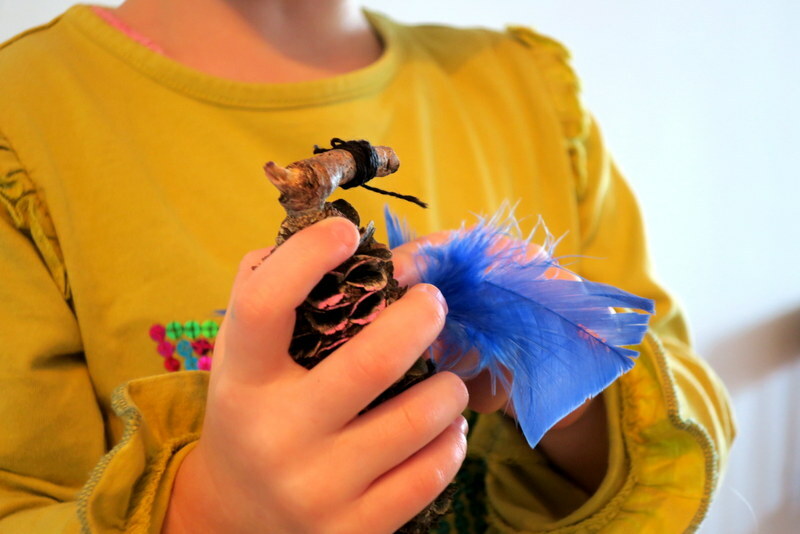 Ickle announced that she had brought in “a pine cone from Newcastle”. Well. Almost. Today, it was time to apply the very important finishing touches to our little pets: the wings. Mivvy also insisted, quite rightly, on a beak for her special blue-feathered creation. She chose black embroidery thread for the desired effect. 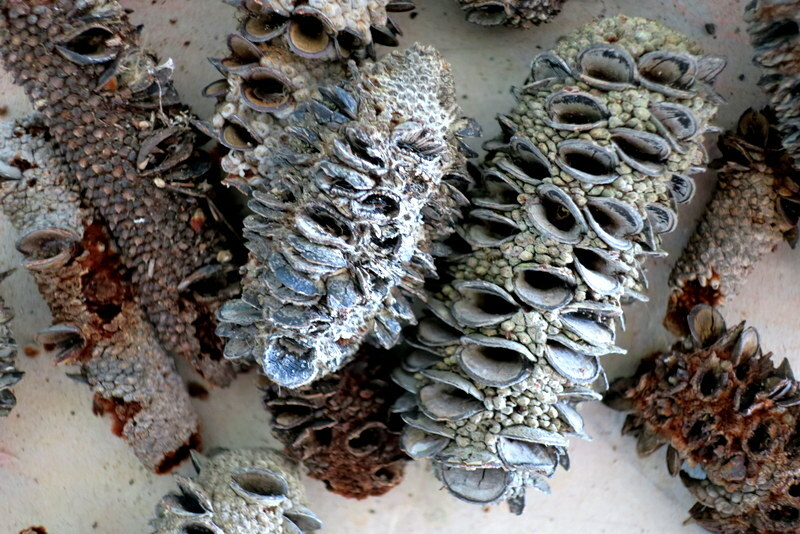 The Banksia Owls have taken up roost again on the verandah, but I think they’d look quite cute as a table centre … once they’re dry. 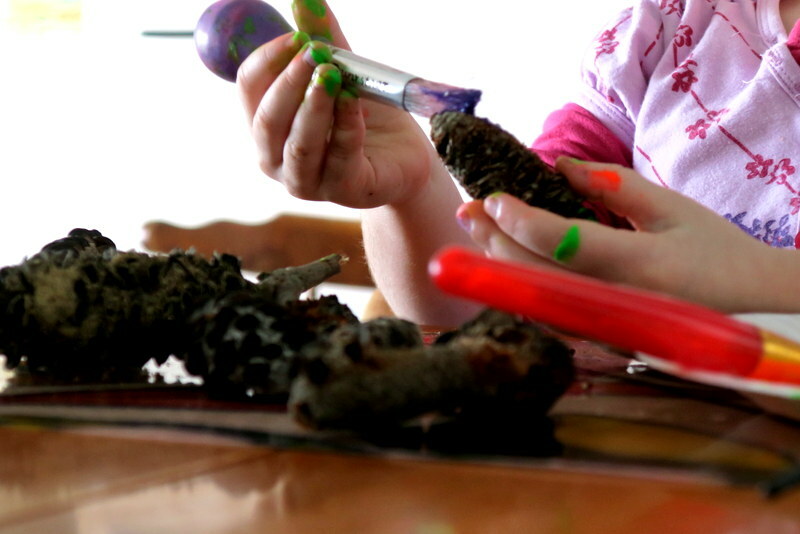 BTW, pine cones would be a great alternative if you don’t have any Banksia trees close by. 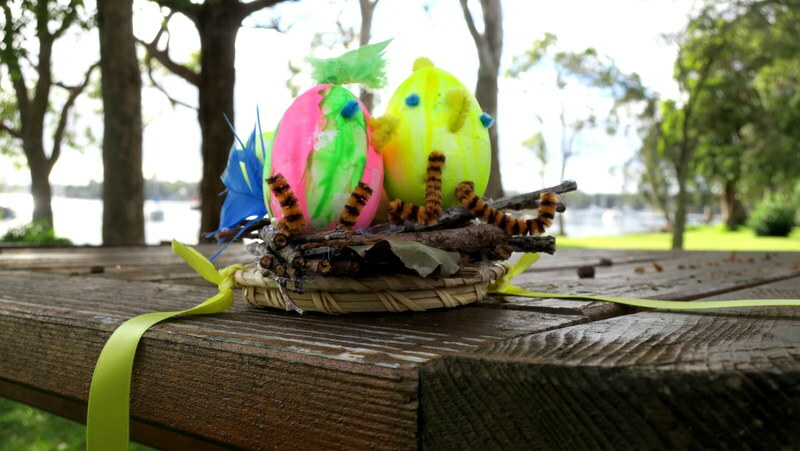 This entry was posted in Easy-peasy craft and tagged Banksia Owls, Banksia seed pods, Norah Head on June 25, 2017 by Laura. 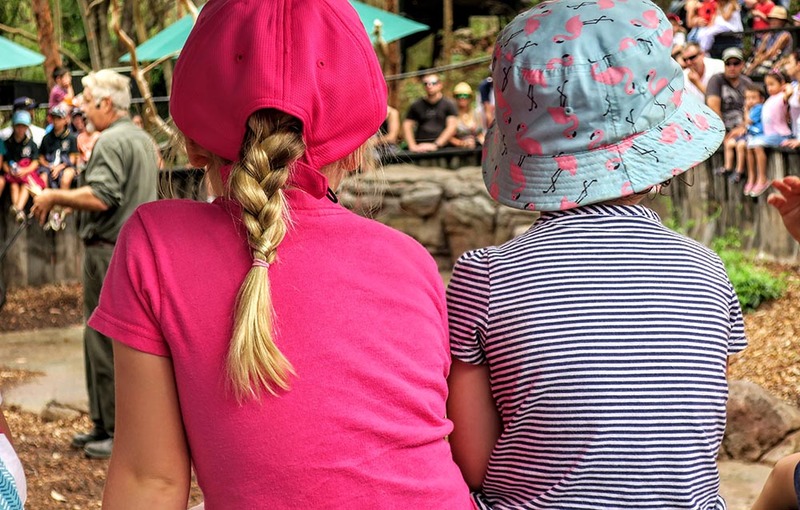 The school holidays may now be a dim and distant memory, but I didn’t want to miss out on sharing our special camping trip with you. “We’re heading to Treachery for a few days,” I’d been telling friends. 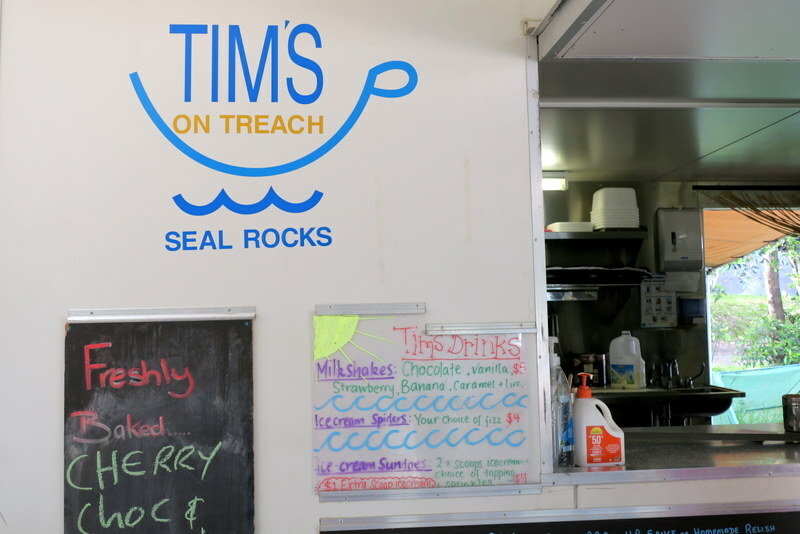 It turns out that Treachery is the name of a campsite at Seal Rocks, about 2.5 hours’ north of our Lake Macquarie home. 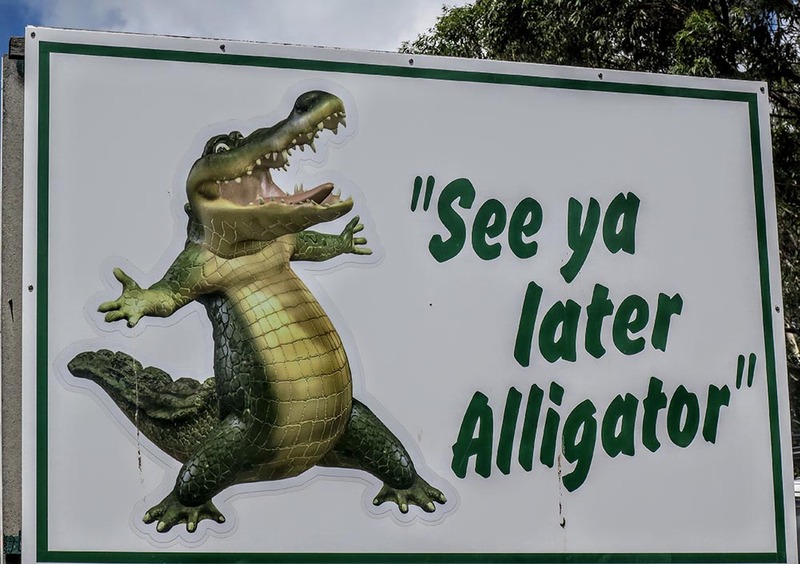 And it is a popular holiday destination … to those in the know. With some trepidation, I booked us in for three nights. What if the girls hate it? I wondered. What if they get freaked out by life under canvas and want to leave? I needn’t have worried. They loved it. 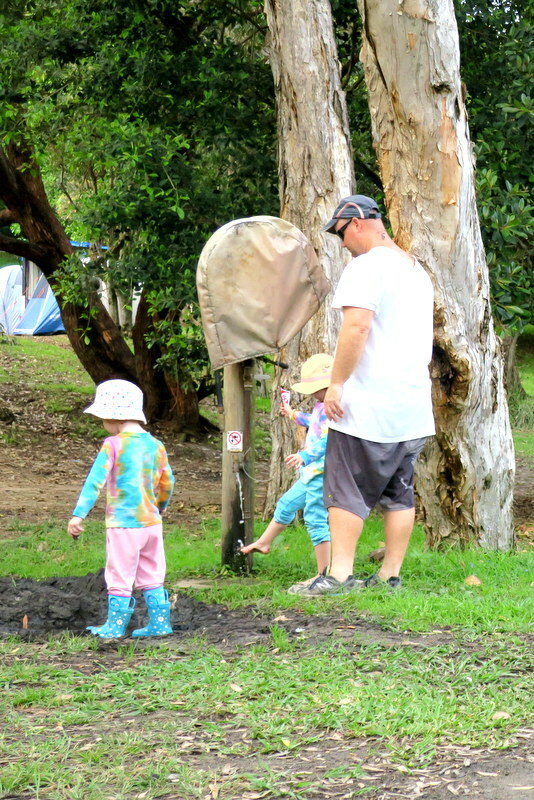 Pitching a tent, toasting marshmallows on the campfire, watching spontaneous puppet shows, playing ‘Beanie Boo go’ (don’t ask – I’ve got no idea), hanging out with their cousins at the beach … And – hey – the campsite even had its own little café with barista-made coffee. We were practically glamping! We didn’t venture much further than Treachery Beach this time. But we did go for a beautiful nature walk along the clifftops where we intrepid explorers spotted a diamond python, a scary spider, and a pod of dolphins in the water below. 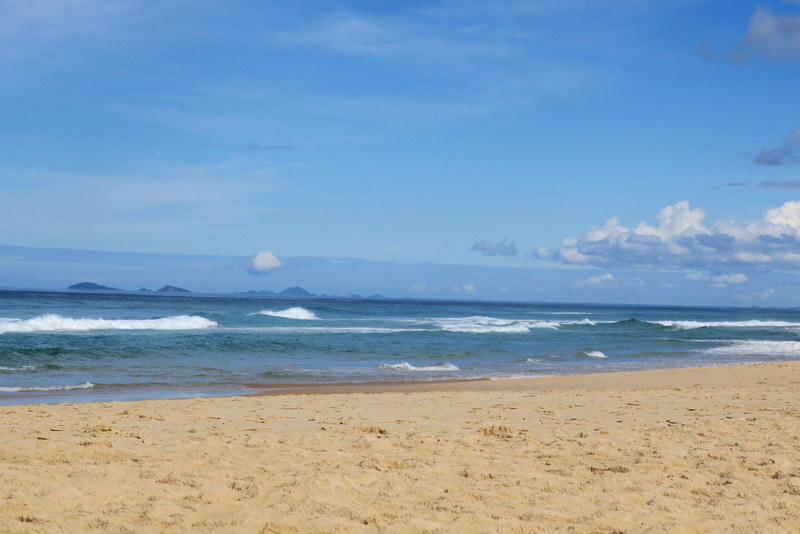 On our next visit to Treachery – and we’ve already decided on a next visit – we plan to check out the local lighthouse and maybe some of the eateries at nearby Blueys Beach. 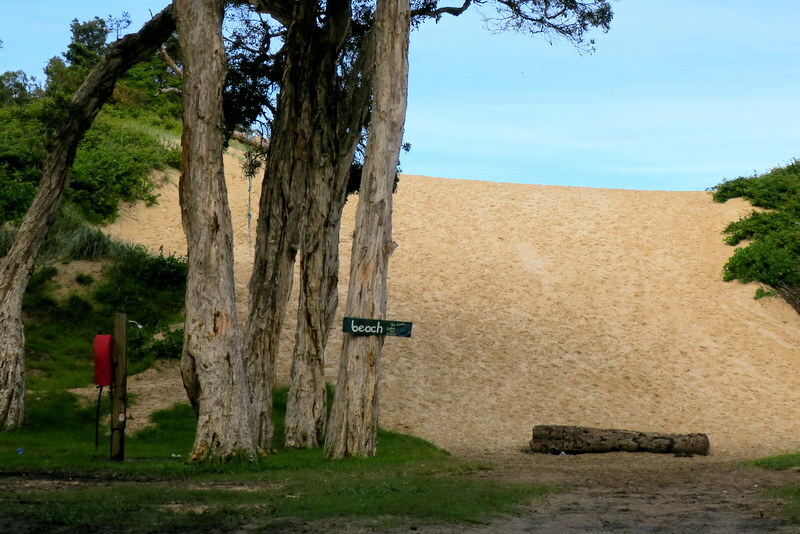 This entry was posted in Adventures and tagged Blueys Beach, camping, glamping, Seal Rocks, Treachery on May 27, 2017 by Laura. 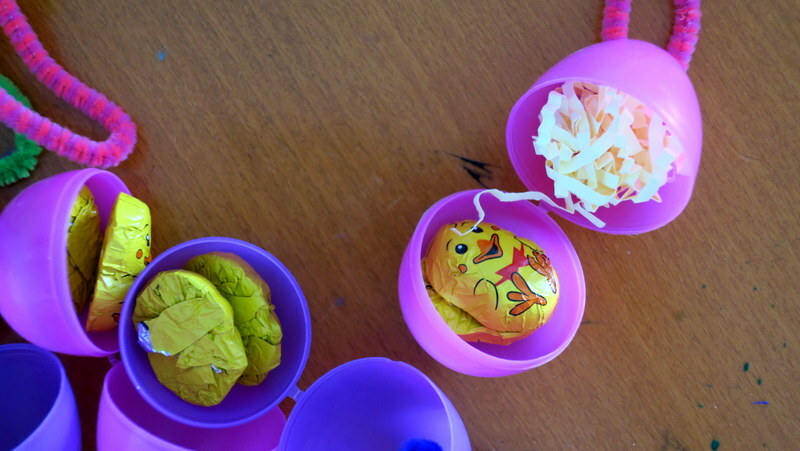 We’ve had egg-cellent fun in the run-up to Easter. 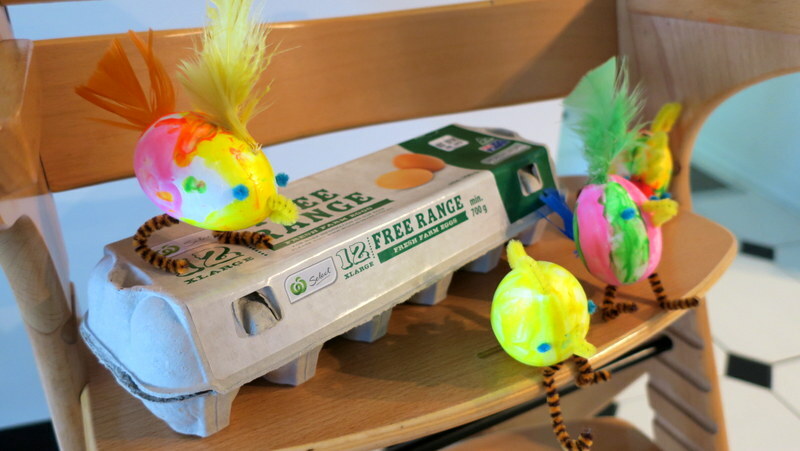 First, we decorated some polystyrene eggs for Ickle’s Easter bonnet. Check out these cute little chickies! Ickle wore the bonnet at the school Easter parade while her proud parents looked on. 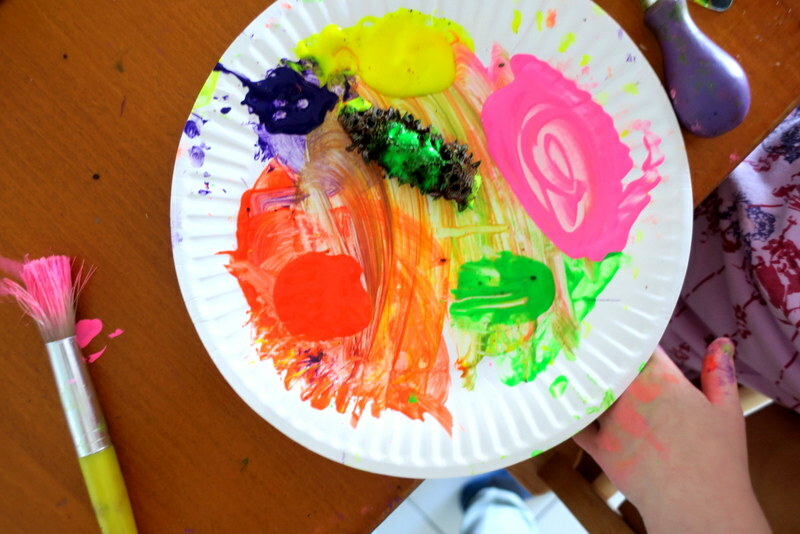 We did have a last-minute panic about our colourful creation slipping off, so the final version had a small square of non-slip table mat attached. 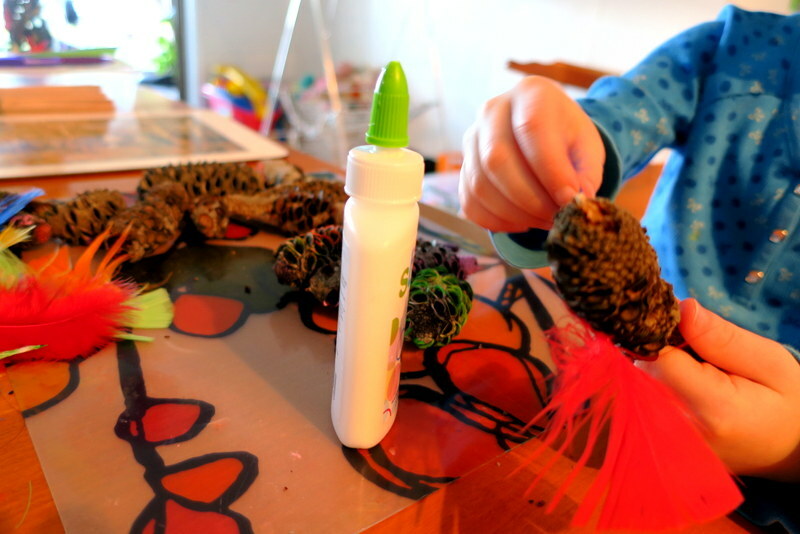 And fresh glue that seeped through to Ickle’s hair and kept it nicely in position, even when she was singing ‘Hop, Bunny, Hop’ with the accompanying actions. The bonnet is a bird’s nest … just in case you were wondering. 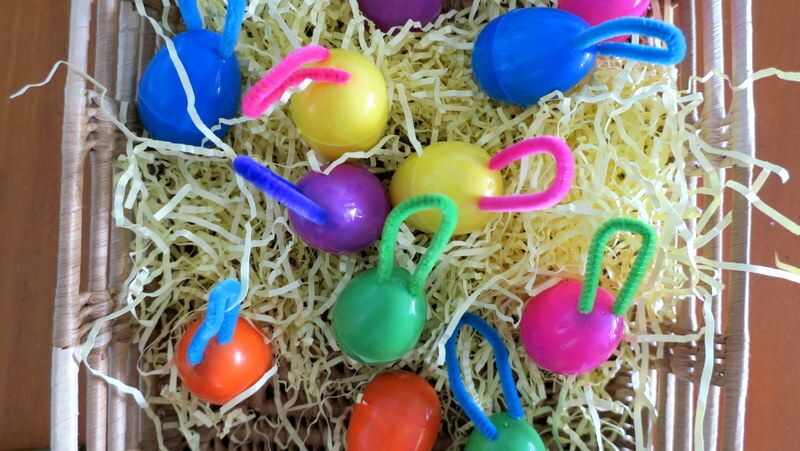 We also put together some Easter treats for our friends. Sweet, simple and effective. Happy Easter from us all! 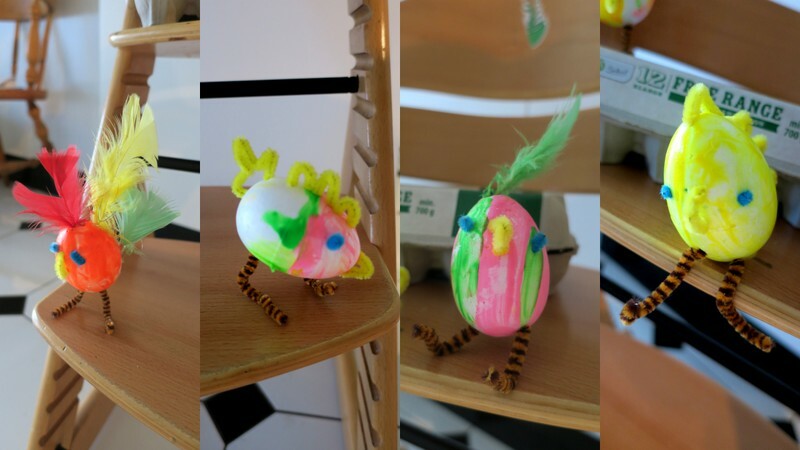 This entry was posted in Easy-peasy craft and tagged Easter bonnet, Easter chickies, Easter parade, eggs on April 15, 2017 by Laura. This could be the wettest March in recent years, according to the experts. 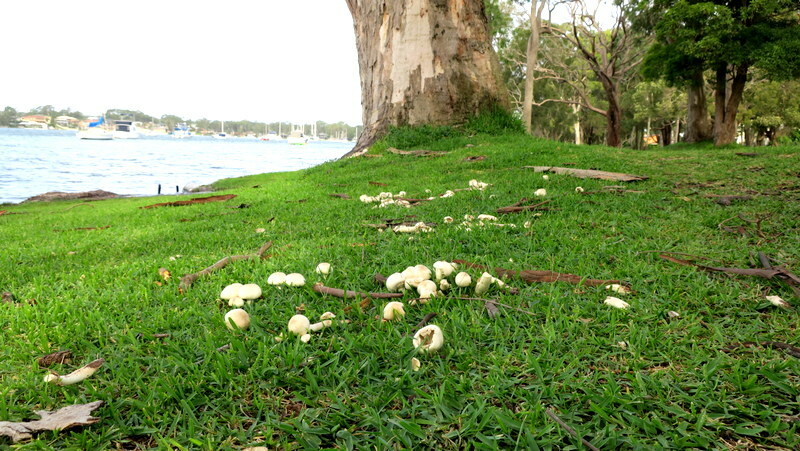 We’ve still got a few days to go before they tot up their totals, but the local mushroom population is out to party. 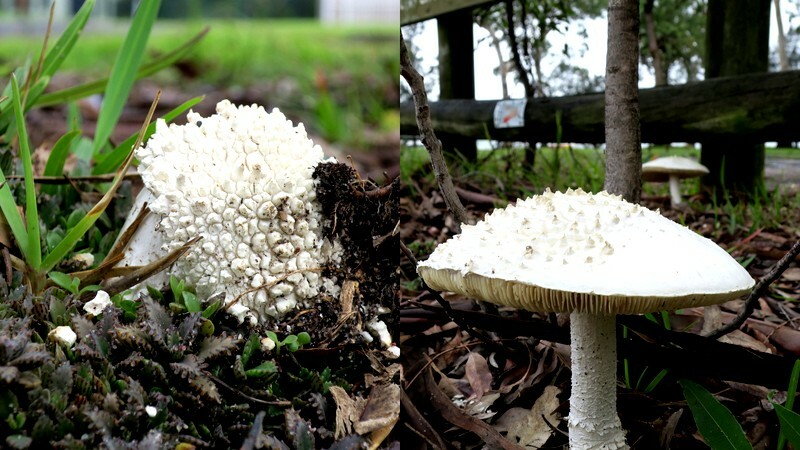 Weird and wonderful fungi have been popping up to say hello on a daily basis. I’ve never seen so many along the lakeshore. These pics were all taken within a 5-minute walk from my back door. Except the two images below where, following a hot tip-off, I hopped on my bike and cycled all of 5 minutes down the road. Worth it, though. Could they be alien life forms in various stages of development, I wonder? Nope, they’re mushrooms, of course. Although I’m not sure which species. 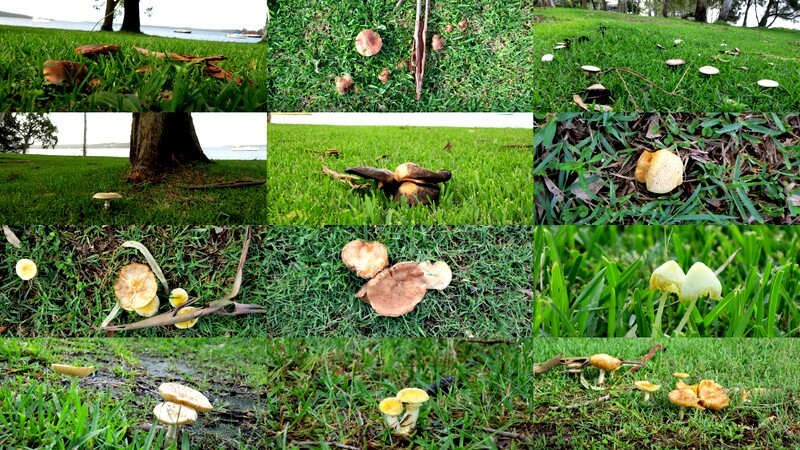 In fact, I am unable to put a name to any of the wonderful fungi I have photographed. Any budding mycologists out there, please enlighten me. 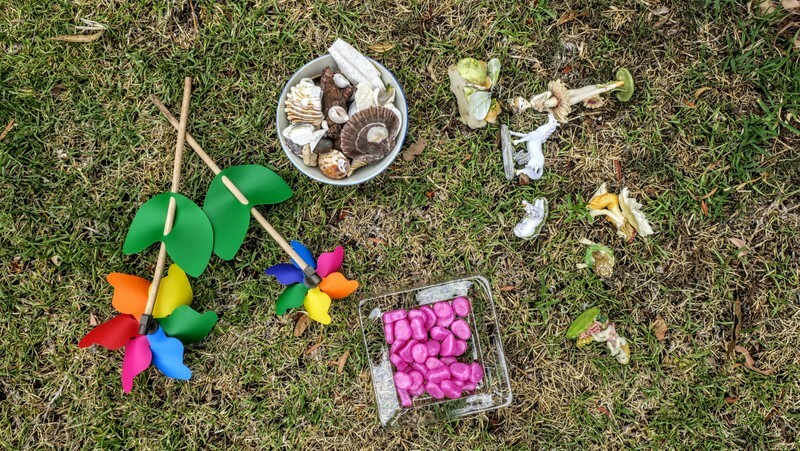 *IMPORTANT NOTE: I read this weekend that jumping on mushrooms is not advisable – inhaling spores from certain species can trigger allergic reactions in some individuals. This entry was posted in Close to home and tagged fungi, mushrooms, mycologists, species, wettest March on March 26, 2017 by Laura. 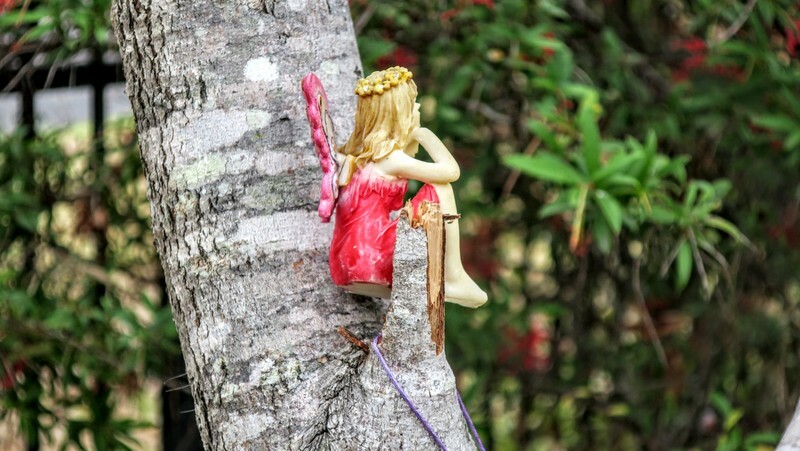 We have a resident fairy at our place: Lucy Rosebud. She comes and goes via a fairy door placed high on a bookshelf in Ickle’s room. Sometimes, she leaves little notes and gifts. And once, Ickle woke to find a heart traced in green glitter on the bedroom floor. 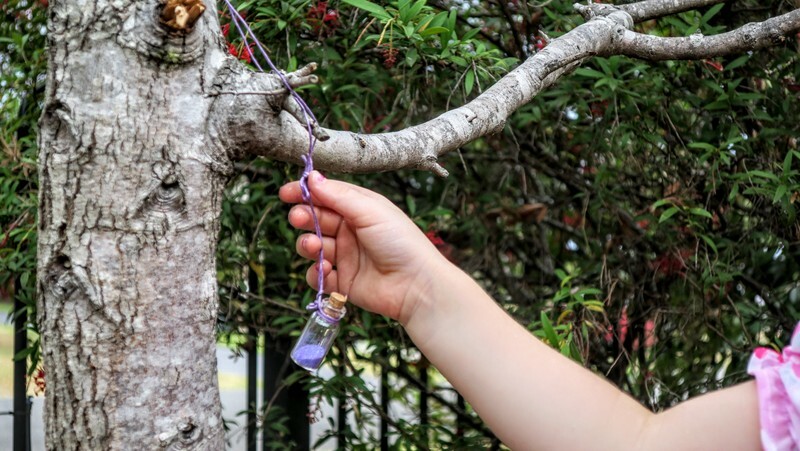 Glitter is fairy dust, after all. But the magic is not confined to inside. 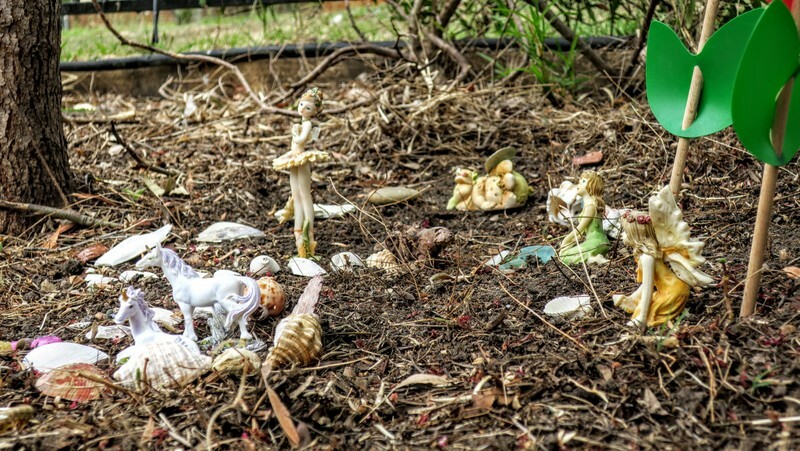 We also have a fairy garden conceived and constructed by Ickle with a box of trinkets she was given by her cousin. Before work got underway, though, we decided we needed a few extra pieces to complete the collection. Hence an excursion to Wyee Nursery, where we enjoyed a coffee and babyccino and fed the fish before checking out their extensive range of fairy ornaments. 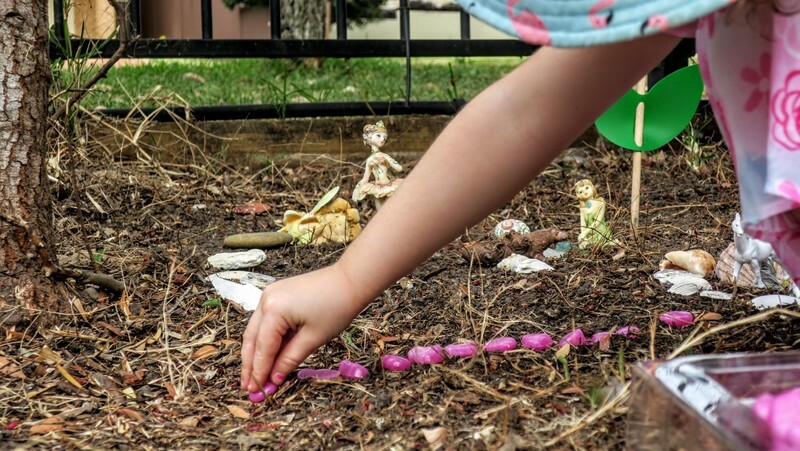 Clutching a couple of miniature unicorns, two pinwheels and a bag of pink pebbles (glow-in-the-dark ones, no less), we returned home. 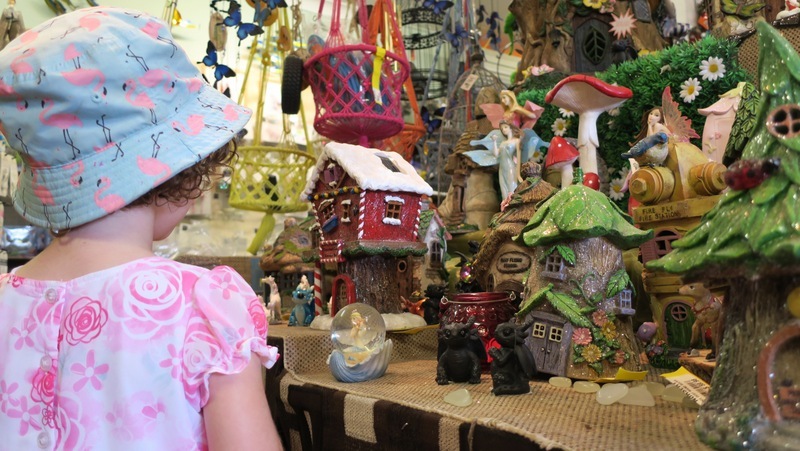 Ickle arranged everything until it was a perfect fairy paradise. 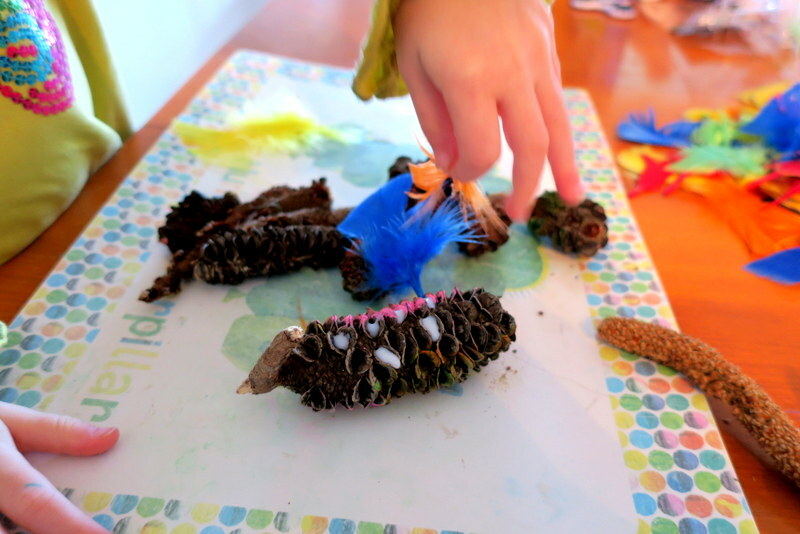 This entry was posted in Close to home, Ickle things on March 19, 2017 by Laura. Ickle spotted them first, the giant inflatable clowns positioned at various strategic locations around Swansea. A dulll are-we-there-yet car journey suddenly became exciting, because there was something different to look at, something fun! 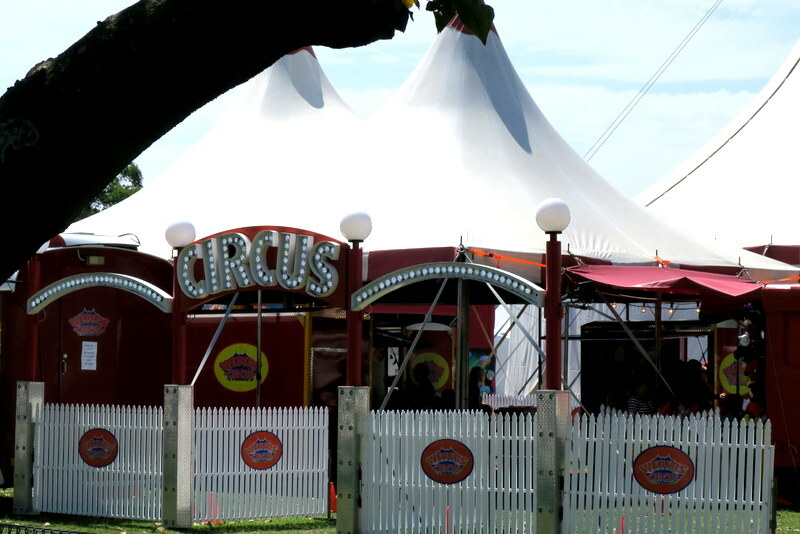 Yes, folks, the circus is in town. And we wanted to see what it was all about. 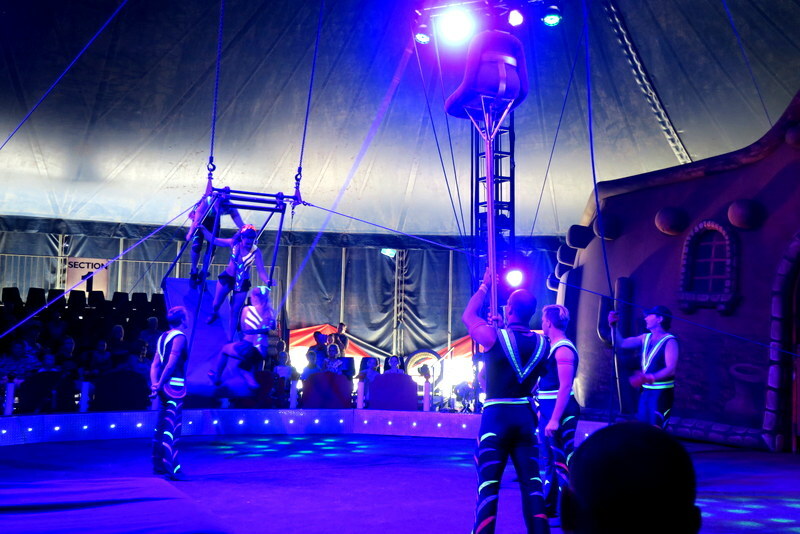 So last weekend, we headed to the Big Top in Quinn Park. We had opted for ringside seats. Although at the more expensive end of the range,* it was so worth it. Sitting just two rows back from the ring, we had an unobstructed view of the action (give or take a few stray heads). 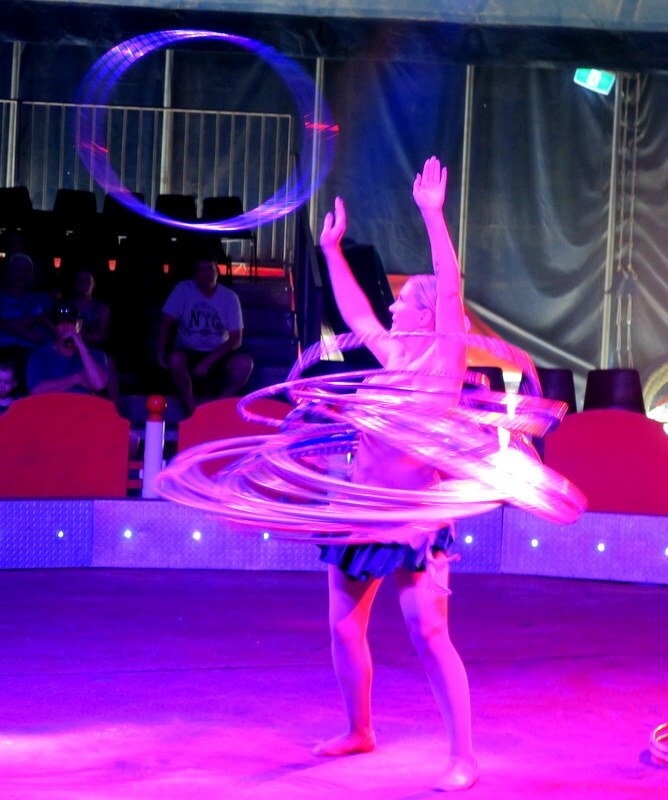 Webers Circus are currently on tour in NSW with their “Wild West” show. In keeping with the theme, we were treated to whip cracks, Cowboy and Indian costumes and line dancing. The real attractions, however, were the main acts – but which was the showstopper? Perhaps it was the talented juggler. Or the queen of hula hoops. 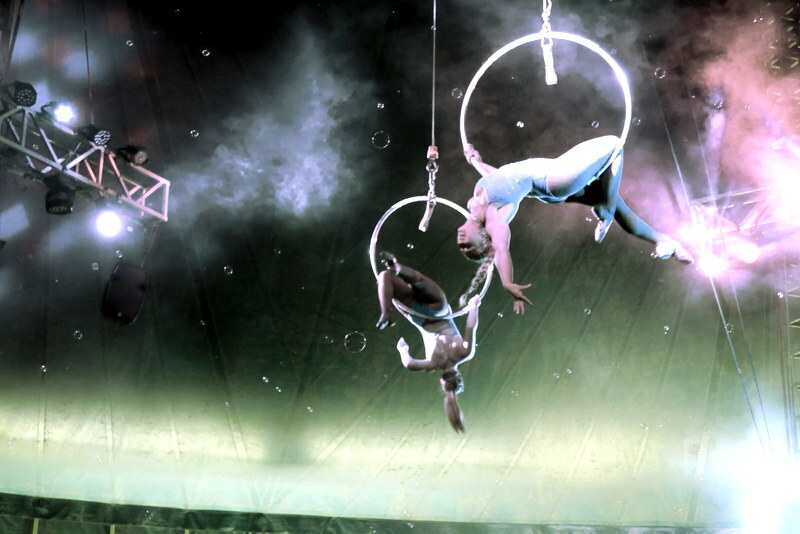 Or the Lyra, where the circus artists performed aerial acrobatics, and succeeded in folding their bodies in ways I didn’t think were humanly possible. Perhaps it was the Wheel of Death, where the star performer kept impeccable balance, and a huge grin on his face, as he ran inside a huge metal hoop. And then outside it. And then did it blindfolded. High above the circus ring. Or the grand finale, the Russian Swing, which catapulted acrobats high into the air onto a crash mat. And, more daringly, onto a chair held aloft by another performer. And even into the arms of a catcher, hanging upside-down by his feet. There was barely time to pause for breath during the two-hour show. Even during the interval the action continued, with a jumping castle, teacup ride and refreshments outside the Big Top. We loved it, although the girls were more than apprehensive at the start of the performance. Ickle was terrified the performers were going to fall, and Mivvy announced after the first act that she wanted to go home. 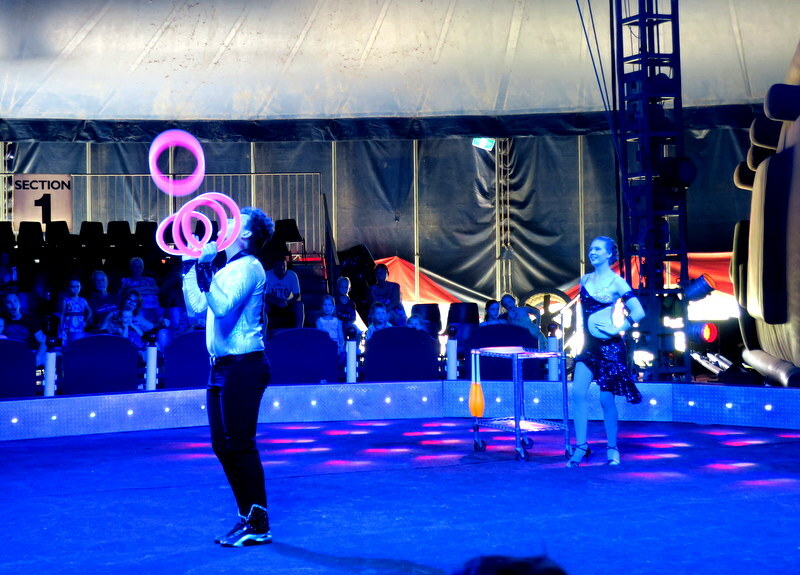 By the time we got to the second half, however, the circus had worked its magic on both of them. They want to go again, right now, but we might leave it until next year. 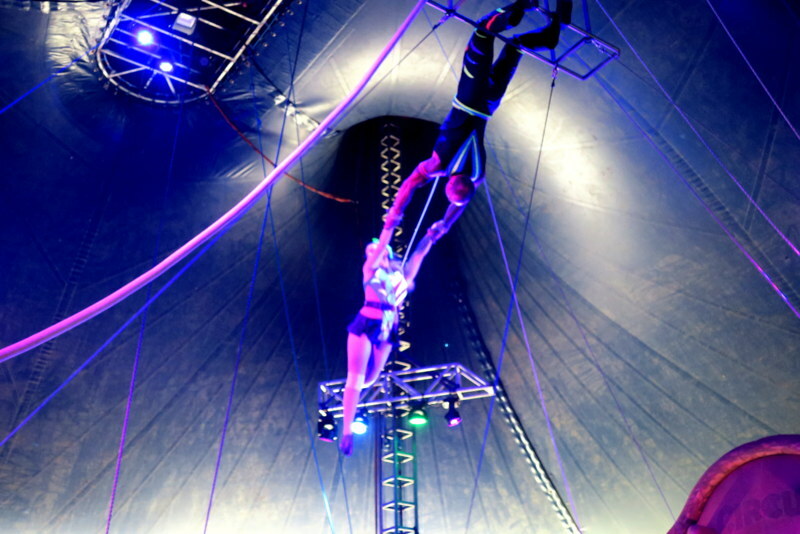 This entry was posted in Close to home and tagged acrobatics, Big Top, hula hoops, juggler, jumping castle, lyra, Quinn Park, Russian swing, Swansea, Webers Circus review, Wheel of Death, Wild West on February 9, 2017 by Laura. 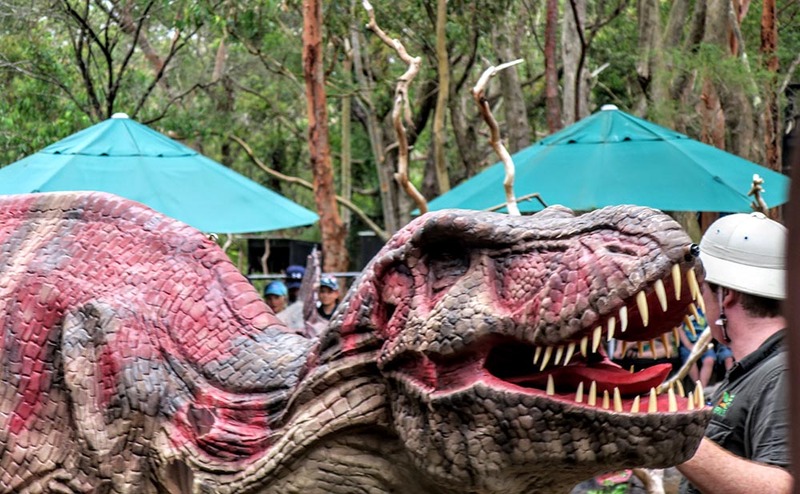 Getting up close to dinosaurs was an unexpected bonus of our recent visit to the Australian Reptile Park. Ickle leapt out of her skin when they roared into the show pit. Her cousin lasted a tad longer. “They’re not real,” she said. “They’re not real.” But she failed to convince herself, and we ended up in a trembling huddle with Mivvy, who had been playing in the dirt, oblivious to the excitement. 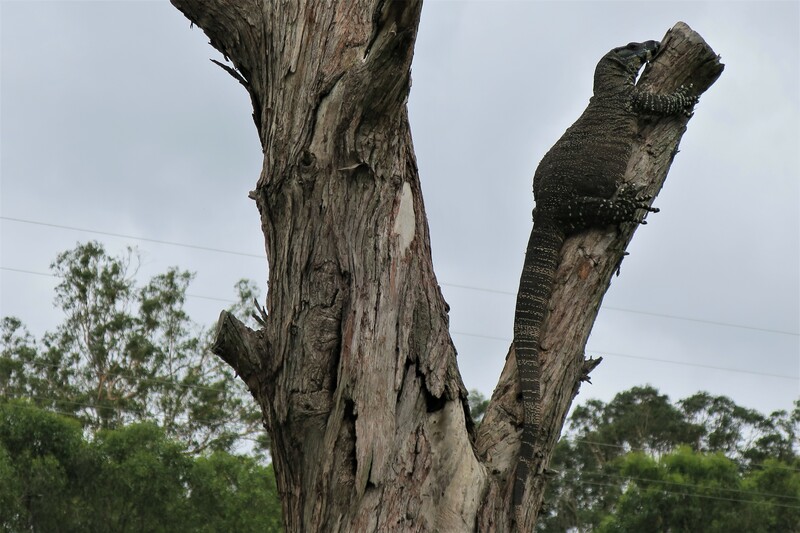 Located in Somersby, not so far from the beautiful falls we visited last year, the Reptile Park is one of NSW’s premier tourist attractions. At $95 for a family pass or $35 per adult, it is an expensive day out. * And the site is not that extensive, either. 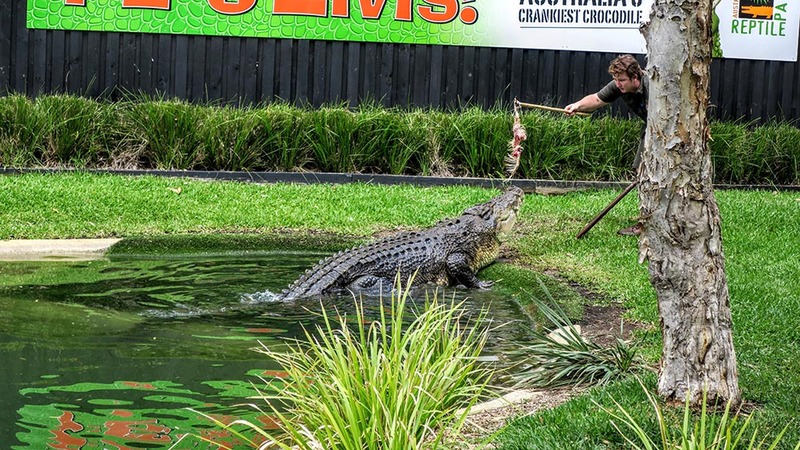 What it lacks in size, however, it makes up for with its “hands-on zoo” experience, allowing everyday folk the chance to view crocodiles, turtles, snakes and the like at close quarters, along with some of their well-known furry friends. The park is also home to a snake and spider venom-milking program – worth the entry price several times over, I reckon. 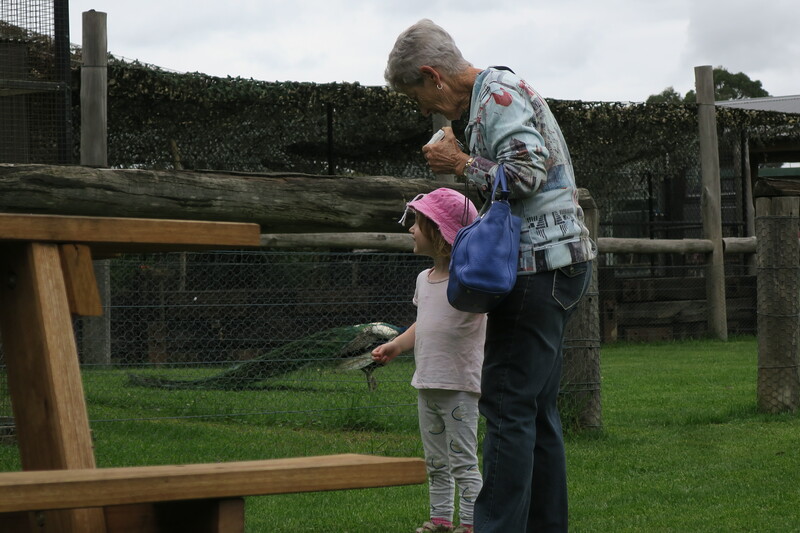 Shows are scheduled throughout the day, where visitors not only see the animals but learn about them too. As well as the Dinosaurs Alive and Reptile show, we hung out with a Galapagos tortoise at feeding time, and then with Elvis the Crocodile. It happened to be the cranky croc’s 50th birthday. He’d already snapped up half a cow that morning, but still had room for two chooks a few hours later. Boy, was it busy when we visited, despite the overcast skies and drizzle. Our trick was to look ahead at the day’s programme and get in early to guarantee top spots. So, two of us spent 30 minutes staring at an uninterested crocodile lazing in a small pool of green water so the littlies could see him strut his stuff during showtime. But it was worth it! Elvis is one of Ickle’s top memories from our visit. Oh, and one last word before I go: coffee. If you are a aficionado of the barista-made beverage with freshly-ground beans and textured milk at just the right temperature, you have come to the wrong place. The Reptile Park has yet to adopt Australian café culture, it seems, and only serves instant coffee with skim powdered milk. *We saved the cost of one adult entry by using an Entertainment Book voucher. 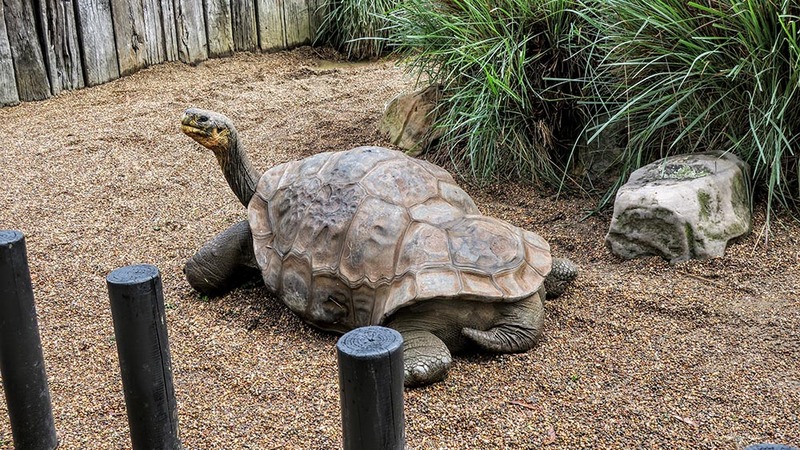 This entry was posted in Close to home and tagged Australian Reptile Park, coffee, dinosaurs, Elvis the crocodile, Galapagos tortoise, Somersby on January 22, 2017 by Laura. I’m a New Year’s Resolution kind of girl. I get excited about fresh challenges and the chance to put my best foot forward. So, as this year draws to a close, I’ve chosen two goals for 2017. One will be revealed in due course (once I’ve got my head around the finer detail); the other is me time. Some people are better than others at making room for “me time’ in their busy lives. 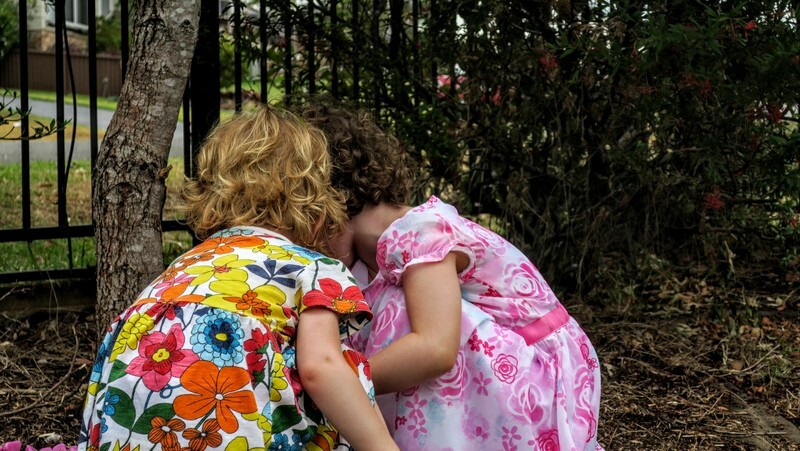 I’ll admit that I’ve struggled to carve out those moments of freedom since becoming a mum – there always seems to be something more important to do. And that’s where I’ve been wrong. By allowing child care, household chores, and work to take precedence nearly all the time, my sense of self has definitely suffered. And I’m sure I’m not alone here. So, recently, I’ve started to do things for me, like join a local writers’ group, or simply sit in a café and drink from a real cup rather than race away to my next destination; I’ve even ducked into a nail salon a couple of times for a pedicure, just for the sake of it. I relish these moments of me time. They help me feel good about myself. And my girls love to hear that Mummy has done something exciting and different, especially if it involves bright pink toe nails! This month, though, I surpassed myself with an unprecedented 24 hours away from home. It all started with an invitation to a work Christmas party. In Sydney. Daddy Ickle encouraged me to go, and even suggested I spend the afternoon shopping for last minute goodies in the CBD. What a great idea, I thought. Then I thought a bit more. What if I do all my Christmas shopping another day? 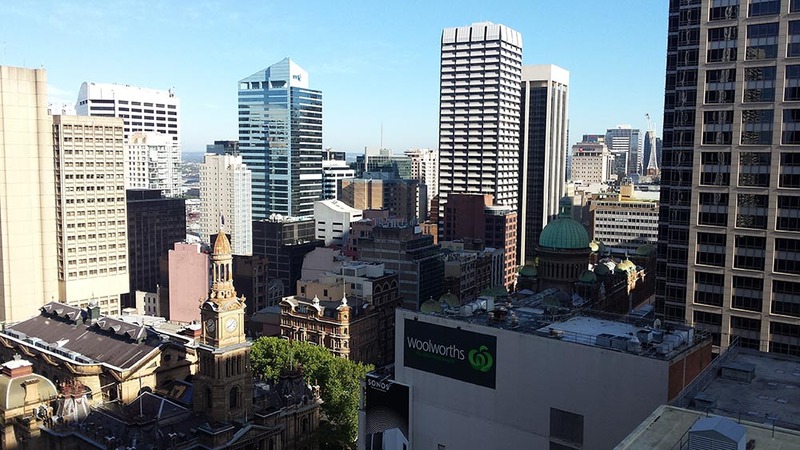 What if I spend the night in Sydney? So I did – both. Free as a bird, I checked into my hotel and headed out into the Sydney drizzle. I skated along the paving slabs on George Street, slick with rain, dodging the chaos of umbrellas and people all the way to the Museum of Contemporary Art. Down at the harbour, ferries were zipping in and out of Circular Quay, and a mammoth cruise ship honked loudly as it farewelled the city. 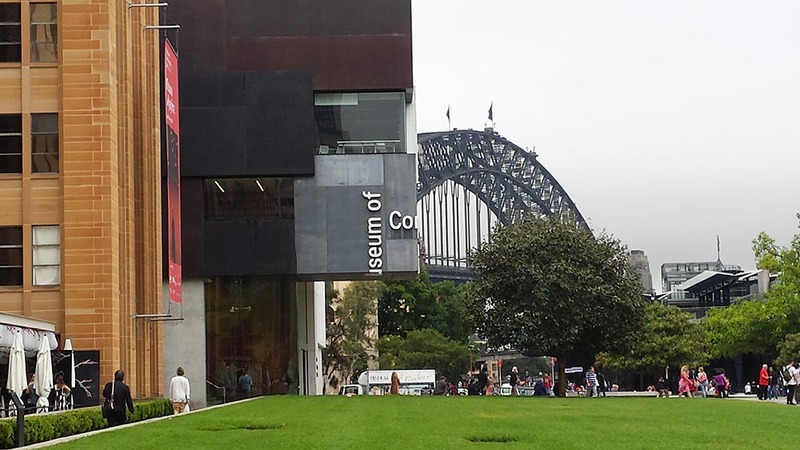 I toured the MCA Collection, Today Tomorrow Yesterday, an exhibition of contemporary art by Australian, Aboriginal and Torres Strait Islander artists. The standout for me was Fiona Hall’s Manuhiri (Travellers), a driftwood installation mounted on a black background. Another highlight was Minyma Punu Kungkarangkalpa (Seven Sisters Tree Women) by Tjanpi Desert Weavers: this dance-like installation was created with rustic materials, including native grasses, wire and aviary mesh. But the real treat was having the time to explore the works at my own pace, and even read the accompanying exhibition notes as I went. What about the party, I hear you ask? Well, that takes us to Grandma’s Bar on Clarence Street. 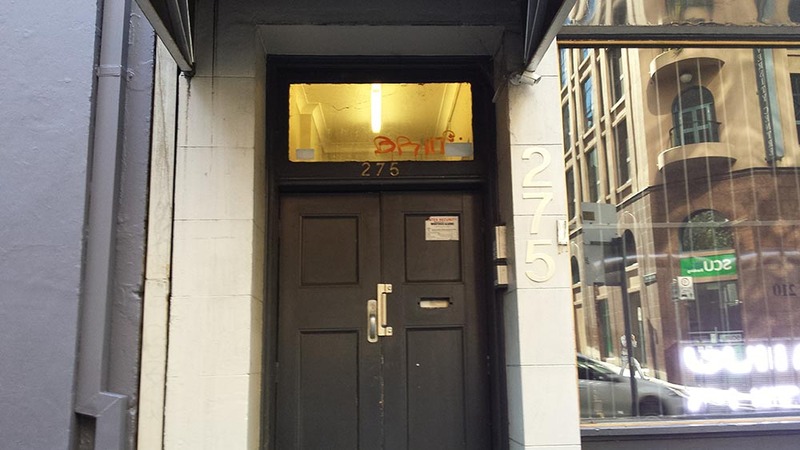 Would you have ventured through this door? 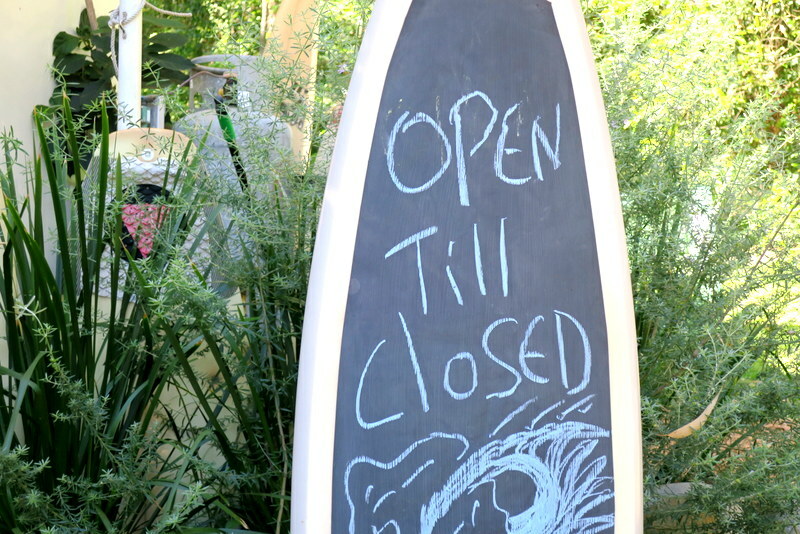 (It was open on Friday night – I returned on Saturday to take the photo.) I hovered outside, double-checked the address on my phone and then headed down into Sydney’s subterranean bar world. Grandma certainly has a weird and wonderful taste in decor (wacky wallpaper for one), but she serves up some mean cocktails. Dinner followed at Lotus in the Galeries, where I sampled some of the most delicious Chinese food I have ever tasted: jade prawn dumplings, native crystal ice plant, crispy skin duck pancakes…in the company of a beautiful team and some stubborn origami butterflies. And, afterwards, it was just a short stagger back to my hotel for bed. At 12.30 am. Way to go! What adventures will 2017 have in store, I wonder. This entry was posted in Further afield and tagged freedom, me time, New Year's resolutions, sense of self on December 31, 2016 by Laura. Shortbread is a treat at any time of the year but at Christmas, with those wonderful festive shapes, it comes into its own. You don’t need much in your pantry cupboard to whip up the most delicious buttery, crumbly biccies. Forget the rice flour, cornflour, etc. 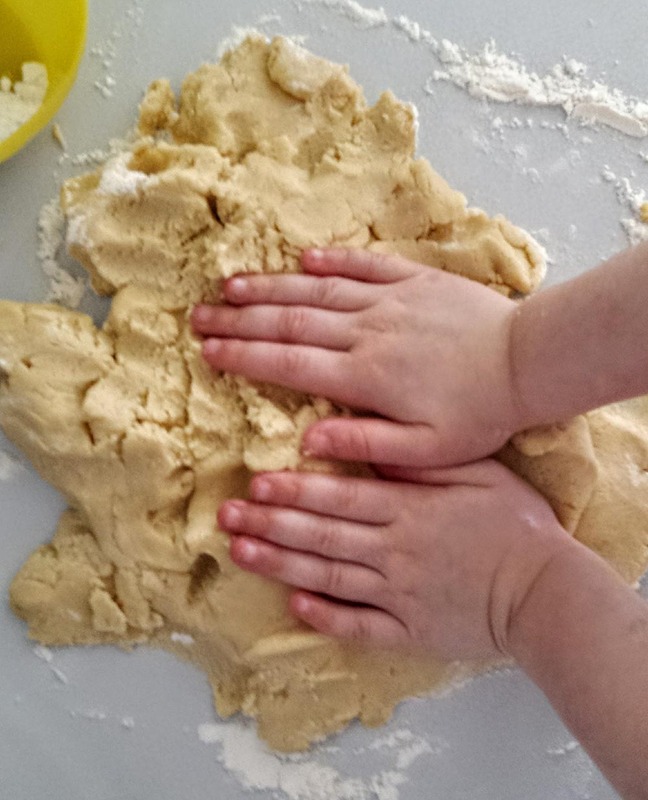 Ickle Chef and I used this shortbread recipe last weekend to make some goodies to take into preschool on her last ever day (sob). It uses just three ingredients: sugar, margarine (I substituted butter) and plain flour. Sooooo easy and child-friendly too. Ickle is becoming a professional sous-chef these days, although I think she is aiming for the top spot. She definitely does not want my help most of the time; she can do it by herself, thank you very much. And so she can. 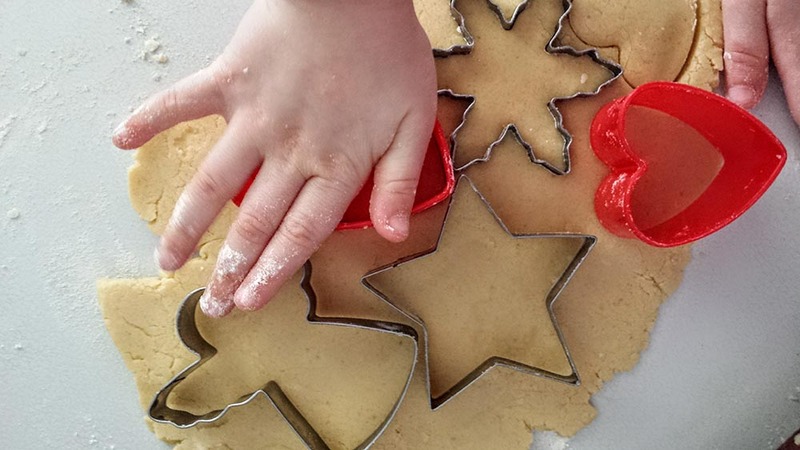 She is a whizz with the hand beater, the rolling pin and the shape cutters. And she really focuses on those finishing touches. I may not have rice flour and cornflour in my pantry cupboard, but I possess enough multi-coloured sprinkles, silver and pearl beads, mini pink hearts and coloured sugar to stuff a small Christmas stocking. 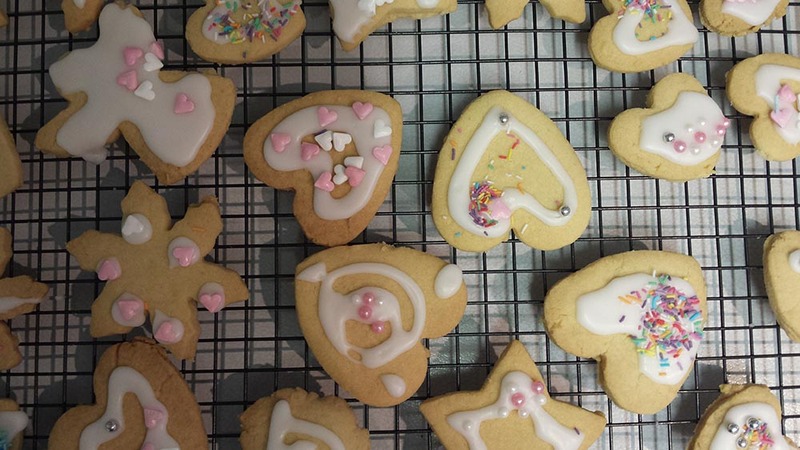 This entry was posted in Food and tagged biccies, Christmas, shortbread on December 25, 2016 by Laura.